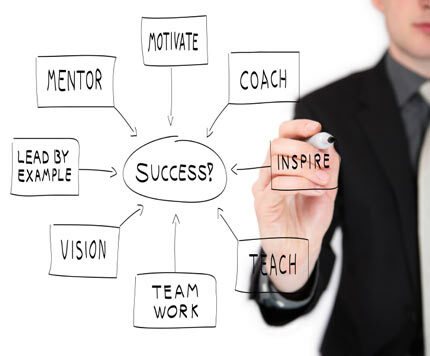 Sales Energizer was developed by business coaches for business coaches. It gives you powerful insights into the companies you advise. 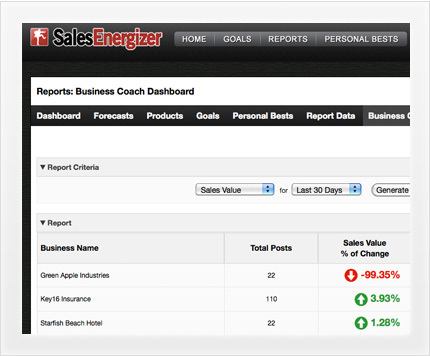 Using Sales Energizer Business Coach Dashboard you can quickly view all your clients' progress at a glance. 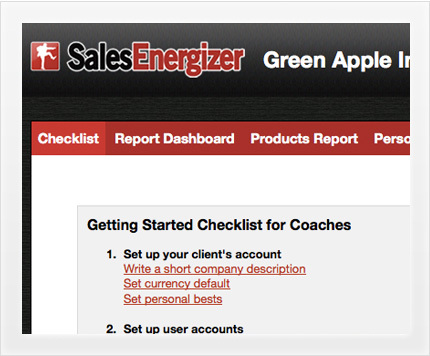 It takes a coach just minutes to set up a new client account, using the Sales Energizer Business Coach Dashboard that gives both you and your client a powerful real-time insight and reporting into their activities. Just as you advise your clients, people Respect what you Inspect, so do the organizations you advise. Your personalized Business Coach Dashboard gives you quick access to all of your clients accounts. At a glance you can view their current performance, then can drill down on specific clients and view specific reports to analyze their performance in key areas. 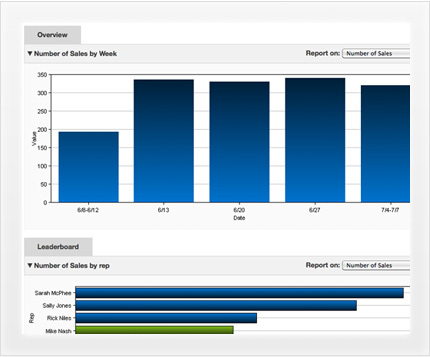 View all reports for all of your clients and with your expertise in growing businesses, identify weak areas in the unique sales process of your clients and create goals to increase the performance in key areas. With your experience and Sales Energizer, you will provide unparalled value to every one of your clients. A unique checklist just for coaches enables you to quickly setup an account for your client in the least amount of time possible and ensures consistency with every setup. You'll have direct access to customize the settings for your clients accounts providing the both of you with unique activity tracking that will enable you to enhance and increase their sales performance based on mutual objectives. Apply for your Free Sales Energizer Business Coaching account. Once this is approved and activated you will be able to invite your clients to sign up. You will also be assigned a unique credit refferal link that will link back to your Coach Dashboard. 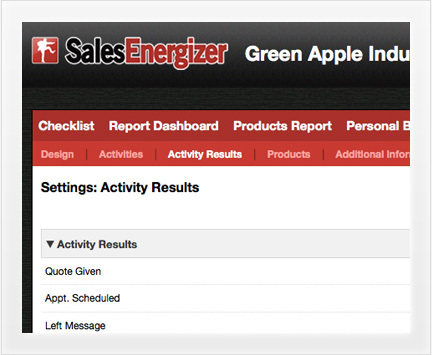 When one of your clients signs up for a Sales Energizer account you'll be notified and you will have access to log in and set up their account for them. You will be able to create individual goals, set activities, forecasts, track results and much more, giving you a powerful tool that works in-line with your coaching strategies and expertise. This live access provides pricessless insight to the inner workings of your client companies and gives both you and your client a results-driven analysis tool. Build the ultimate value with your clients. Apply for your Free Sales Energizer Business Coaching account.